Well-being is a matter of atmosphere. The ClimateActivePaint paint coating contributes to that significantly. In a private as well as a commercial setting ClimaActivePaint ThermoPlus creates a pleasant comfort-climate through its properties. Air is more humid in summer than in winter. 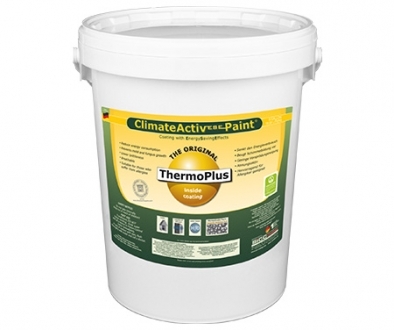 ClimateActivePaint ThermoPlus absorbs humidity from the air and stores it in its membrane and in the wall. The latter has become drier during winter and can absorb air humidity without any damage. Due to the occurring evaporation the ceramic coating ClimateActivePaint ThermoPlus cools the walls, as our skin is cooled through perspiration during summer. The walls "radiate" a pleasant coolness that makes staying in the building during high outside temperatures comfortable around the clock. The result: recreative sleep and more energy for the day. To ensure a steady supply of humidity through outside air one should leave the windows open during summer. Do you have a hot head and cold feet with the heating turned up all the way. Who doesn't know this typical winter feeling? Walls coated with ClimateActivePaint form a large ceramic surface and function during the winter months like a tiled stove that radiates its cozy heat into the room. The small ceramic bubbles that are bound together in ClimateActivePaint, lead the heat like "mini tiles" away from the thermal source at lightning speed, over the coated, enlarged wall and ceiling surfaces. The heat is now radiated warm and evenly into the room. At the same time, excess moisture is pulled out of the walls and released into the air. This is crucial for the insulation effect, as dry walls insulate a lot better than damp ones. ClimateActivePaint ThermoPlus is variably capable of capillary diffusion. Rooms that have been kept cool, for example after a trip, warm up quicker, and in the long-term you can set your heating lower. Experience shows that this will allow you to save more than 30 percent on heating costs. Coating instead of a "Plastic Bag" for your sense of well-being and your health. The ceramic bubbles in ClimateActivePaint are placed in a special, color-like bonding agent. This bonding agent reacts to the ever changing air humidity and removes excess moisture. This way, ClimateActivePaint controls the total humidity level of a room. You are probably familiar with similar items used for clothing, such as GoreTex® or SympaTex® fibres. They feel good, because you are wearing a moisture permeable coated garment, instead of perspiring profusely in a "plastic bag". The coating system is set in such a way to maintain humidity levels in a room at an optimum 55 percent. At the same time, condensation on the walls and mold are prevented - even without constant ventilation in which expennsive heated air literally goes right out the window. Condensate forms because of high air humidity in the coldest parts of a room. ClimateActivePaint ThermoPlus acts against condensate formation by even heat distribution and increasing of temperature and thereby prevents the formation of mildew. ClimateActivePaint ThermoPlus is very well suited for people with allergies or asthma, as it does not release any allergens into the air. There is also no detrimental impact on the air, as the coating is free of any emissions. The typical renovation smell disappears very quickly. A clean and healthy room kept at the correct humidity level makes breathing easier. In short: There is a complete sense of well-being for the whole family. 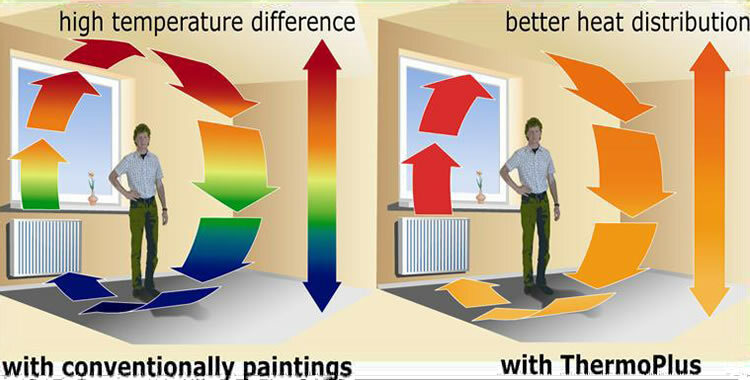 Often used rooms that are coated with ClimateActivePaint ThermoPlus keep their "new" look for a longer period of time. A.S.L.E GREEN SOLUTION Pte. Ltd. (abbreviated as A.S.L.E) was officially separated from our Mother group and established in the year of 2015. Initially, A.S.L.E has played an active role as Main Contractor or Sub-Contractor in design & build factory; including all forms of earthworks, civil & structural works, plant machinery & equipment installation.